Aiden Mullen has admitted that the residential ‘demarcation’ zones introduced in 2013 made ‘no sense’. The critical question now is whether council’s proposals do in fact make more ‘sense’ and whether they are justified in strategic terms as well as improving residential amenity in our local streets. From what has been published thus far, the answer is an emphatic and unequivocal ‘no’. The Garden apartment (three to four storeys) building type seeks to ensure that apartments located within these residential streets look and feel residential with a strongly vegetated garden setting, and a recognizably residential building form. There will probably be no 3 or 4 bedroom apartments in these buildings given the groups selected in the ‘housing opportunities’ section. Most will be 1 or 2 bedrooms – which does not match council’s own current planning scheme! Does council really believe that any developer would constrain himself to build 3 storeys instead of the allowable 4 storeys? The past 4 years provide ample evidence of what a joke this is. Or will we eventually see some further zoning that differentiates between 3 storeys (GRZ) and the 4 storeys (RGZ)? How can a ‘front and back corridor’ be maintained when nothing in the legislation mandates this beyond the current inadequate ResCode ‘standards’ that are not worth the paper they are written on and which both council and VCAT disregard repeatedly? 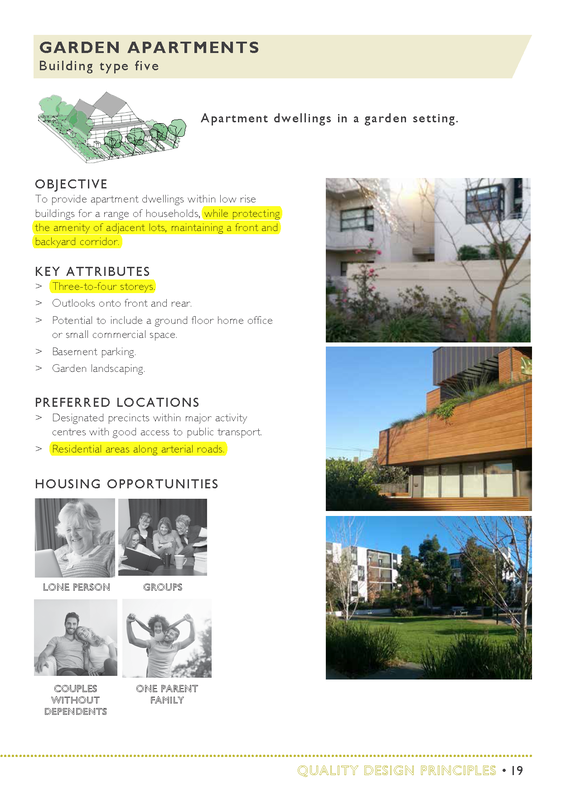 4 storey ‘garden apartments’ are supposed to be along ‘residential areas along arterial roads’. Why then do we have a large section of Rosstown Road in Carnegie changing from 2 storeys to 4 storeys WHEN IT IS NOT AN ARTERIAL ROAD? Why do we have sites along Centre Road, Bentleigh changing from 2 storey to 3 storey, when Centre Road IS NOT AN ARTERIAL ROAD? Why do we have Truganini, also falling into this category? How much more misleading information will council put out for ‘consultation’? According to Clause 55.07, the only mention of ‘communal open space’ is when the number of dwellings exceeds 40 or more. Anything under this number would therefore be exempt according to the legislation! Council’s current schedule to the RGZ zones has the mimimalist standards of 60% coverage, and 20% permeability. There is nothing in these schedules, or in the entire planning scheme, that will MANDATE anything like a ‘garden setting’. Thus is council deliberately conflating ‘private open space’ with ‘garden’ requirement in order to mislead? Change any of the schedules and what these changes might be. We are confident that what will happen is that these crucial ‘details’ will be held back until the very last moment when council will vote to write off to the Minister under Section 20(4) of the Planning & Environment Act and thus deny residents all objection rights, much less their final say on what will be in the final amendment. Most alarming is that not council, nor any single councillor has made mention of the Minister’s latest amendments when they are so crucial to determining sound strategic planning. You’ve certainly been right on this before Glen Eira so a good heads up on these other potential surprises.Not convinced that it is all Aiden Mullan’s doing though.It would appear that his brief is to deliver on the State Government requests, a deal done with others in Council. If so, he has a very tough job as what the state government want and what is best for Glen Eira City are quiet different. Why else would there be a situation where a 12 story zone in Carnegie abuts a 2 story character housing zone in Chestnut Street. Why a 12 story zone at all? I’m not convinced that he should be the one standing up in front of the resident forum. Mullen is the nominated head of this whole enterprise. He must take the major flak. I’ve searched in vain on council’s website for the promised figures on numbers of affected dwellings. No appearance as yet. Politics is at play here in all its dirty guises. Perhaps 12 storeys is nothing but an ambit claim that will eventually be reduced to 8 storeys and council can then claim that they have “listened” to residents without ever having to justify why even 8 storeys is okay. The Labor councillors are backing Wynne and the old Liberal stagers like Hyams, Esakoff are desperately trying to cover up their guilt over the shambles that happened in 2013 under Guy, Newton and Akehurst. Meanwhile residents are stuck in the middle of these power politics and taken for idiots. Hyams is already repeating his old worn lie “developers cannot build anything under the new plan, that they could build under the old plan.